I am a new Member and trying to import datas. 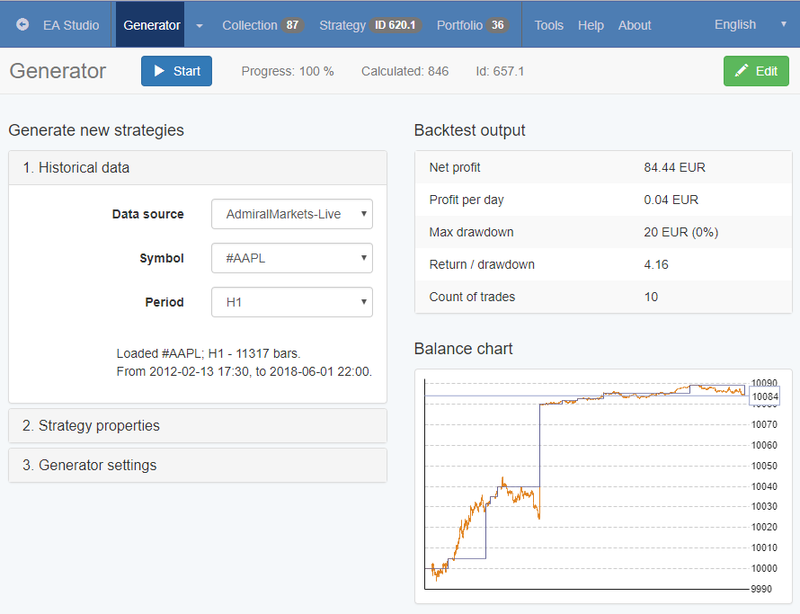 EURUSD, XAUUSD FX datas works fine. But CFD Stock Datas like AAPL or NFLX are getting errors. Does anybody know another idea to catch all files? When ever i login new - the datas don`t work - have to upload them again. If I do only 1H strategies - is it enough to upload only 1H.json file or its better to have for the tester always all? Bildschirmfoto 2018-06-05 um 14.05.52.png 91.05 kb, file has never been downloaded. Please upload the exported data file that doesn't work. We will test it. > When ever i login new - the datas don`t work - have to upload them again. 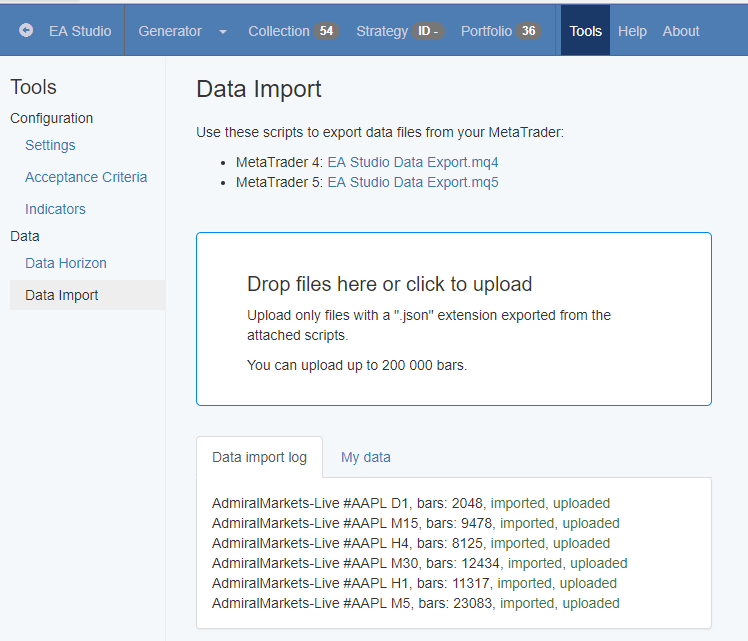 If you are logged in during the upload, EA Studio will upload the data to the server. You will be able to see them in the app. > If I do only 1H strategies - is it enough to upload only 1H.json file or its better to have for the tester always all? The single file is enough for the Generator to work. However, it is more continent to have all the periods uploaded. Attached the files to testing. XAUUSD as I told works fine at all. AAPL and NFLX works only once after upload then not. But I see them in the Database. As soon I change the Data Horizon it doesn't work. If I want get specific dates I change the Data Horizon first and upload again then it works. I tested your data and they work fine. You may switch off the Acceptance Criteria for tests and later to start setting them one by one. I see now. After reloading EA Studio, it doesn't load the files. It is good that I was able to reproduce the problem. I'll fix it tomorrow and will post details. It appears that the server framework I'm using doesn't allow downloading files, which starts with a hashtag. As a result of that, we can load such files and use in EA Studio and it successfully uploads the files to the cloud, however it is not able to recover them when we reload the program. I'm searching for a workaround now. The problem is fixed and a solution is uploaded. Please reload EA Studio and it will be able to handle symbols that starts with #. It appeared that this is my mistake because the "#" character is not safe in URLs. Now EA Studio correctly calls such files by replacing the "#" internally with the correct "%23" value.